There are many pleasant landscape related experiences in Wakulla County during March. For the homeowner it is a time of low-impact duties in the garden and around the lawn. The leaves and pine straw are raked up (or should be) and in the flowerbeds. It is time to pull out the lawnmower and service it, but it will not be used for weeks. There is, however, one job which should be done now, Now, NOW. That is spray the lawn with a pre-emergent herbicide to stop the warm season weeds, especially the dreaded curse purple nutsedge, from emerging. Purple nutsedge, Cyperus rotundus, can grow from every possible sunny location with soil. This non-native plant is a rapidly spreading perennial which will take every opportunity to colonize new locations. The purple designation is in its name because there is a purple-tinged section of this sedge where it emerges from the ground. The plant is sometimes referred to as purple nut grass because of its long narrow leaves and its erect growth pattern originating from a nutlike basal bulb. There are other sedges in Wakulla County, but only yellow nutsedge is identified by a specific color. It is sometimes called chufa and is a popular feed for wild turkeys, and turkey hunters. The dark green, smooth leaves blend in easily with many turf grasses during the growing season. Beneath the soil’s surface and out of sight, the root system spreads in every direction. Purple nutsedge’s roots are a series of dispersing rhizomes and tubers or bulbs identified as nutlets. Each nutlet sprouts a new tuft of grass-like leaves and continues growing the rhizomes. The dense population of this sedge quickly crowds out most other plants, but especially turf and forage grasses. It can reach a height of 18 inches on its triangle shaped stem. The root system’s design assures this plants continued success. 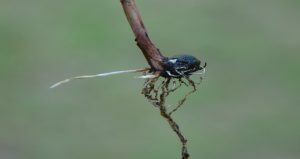 If pulled, the rhizomes break off leaving a large number of nutlets to develop and emerge independently at a later date. If plowed or tilled, the nutlets are detached and spread to new and inviting locations. Many times nutlets lodge in tillage equipment only to shake loose and deposited in un-colonized locations. Most post-emergent herbicides have little effect on this sedge’s hardy root system. Only selected pre-emergent herbicides will prevent many of the nutlets from germinating in spring, if properly applied. Wakulla County’s sandy soils provide an ideal growing environment for purple nutsedge. The occasional periods of saturation from storms do not deter this plant’s rapid growth and expansion to new areas. Purple nutsedge’s extreme competitive nature is a heavy consumer of plant nutrients. It robs rivals of important compounds necessary for their survival, and produces an allelopathic substance which is toxic to some plant competitors. Purple nutsedge is found in many locales in North America where the environment is hospitable to its growth. The autumn cool and shorter days send this exotic pest into dormancy, but the seeds of next year’s crop, and associated landscape problems, are just under the surface. Just like desirable turf in north Florida, purple nutsedge will not grow in heavy shade. Typical of most weeds, it only reduces leisure time. Now, Now, NOW is the time to get purple nutsedge under control. It is a good thing March has so much time to get ahead of a problem which will consume so much effort later in 2019. To learn more about purple nut sedge in Wakulla County contact the UF/IFAS Wakulla County Extension Office at 850-926-3931 or http://wakulla.ifas.ufl.edu/.